Members of the Branch are rallying in support of the Blue Goose Country Pub on Lanark Road, Slateford, Edinburgh. The pub is under threat of demolition as a result of a bid by Lanark Road Living Ltd to build student flats on the site, which is next to the Water of Leith. The branch encourage members as well as other local supporters and regulars of the Blue Goose to register strong formal objections to the formal planning application, which can be viewed on the Edinburgh Council website. We are also looking to establish a dialogue with the current owner of the pub to identify alternative strategies for the Blue Goose that will avoid its sale to property speculators for demolition. This pub sells good Real Ale and is a major community asset. We want to keep it that way and, in fact, help to make it even better. The Water of Leith Conservation Trust have expressed their views of the proposed development on their blog. Follow latest developments on Twitter (#savethebluegoose). 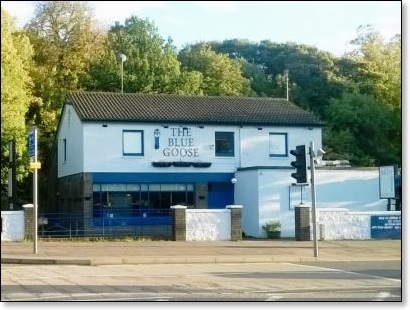 A planning application has been lodged that seeks to demolish the Blue Goose pub which is located at 27 Lanark Road. It has also been known as The Tickled Trout and The Dell Inn and is notable for being the only pub situated on the inland part of The Water of Leith. If you have walked or cycled along the Water of Leith Walkway or the nearby Union Canal towpath you have no doubt enjoyed a drink or some food there and would be sad to lose it. The application seeks to replace the pub with 247 student flats and is located here https://citydev-portal.edinburgh.gov.uk/idoxpa-web/applicationDetails.do?activeTab=summary&keyVal=NYDFUKEWK8D00 Or http://tinyurl.com/hq7z8h8. I am asking for your help in raising objections to this application. The documents associated with the application run to many, many pages and I do not suggest that you read through them, unless you really want to. Instead, I have noted below some things you may like to use as comments. It is not necessary to personalise them, but feel free to do so or to add your own. The deadline is 7th January 2016. There is no evidence that the applicant has demonstrated that the premises has been sufficiently marketed for continued use as a public house or that the premises is unviable as it stands. The pub is an incentive to anyone planning a walk or cycle trip with a lunch or early evening stop along the Walkway or the nearby National Cycle Route 75. It thus offers a valuable amenity. A number of aspects of the proposals are outwith the provisions of the 2010 Edinburgh City Local Plan, specifically parts 3.23 (Waterside Developments) and 3.26 (Tall Buildings). This is largely because of the massive impact that the twin blocks will have on the vista across the Water of Leith from the Lanark Road side. The application spuriously claims that views from The Water of Leith walkway towards the development will somehow be enhanced. How this can be with such an unattractive, identikit design, completely lacking in imagination for such a visible site, is not explained. To submit a comment, follow these steps. 2) Click on the box, Make a Public Comment, on the upper right of the screen. 3) Fill out the screen that appears. Under Commentator Type, select Member of Public. Under Stance, select Object. In the Your Comment box, copy/paste any of the suggested or add your own. 4) Click on Submit. NB: You should not be prompted to Create an Account. If you are, click on register and then proceed per on-screen prompts. If you have any queries, please contact me at pubheritage@edinburghcamra.org.uk.